This will be out home base during the course. 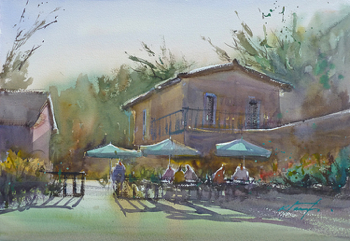 Whether in a spacious studio or en plein air, the Watermill offers plenty of beautiful and inspiring subject matters. The river Rosaro flows beside the Watermill and in the riverside gardens are quant wooden bridges with curvy handrails: endless subjects to paint! During a week at Watermill, we can live like Italians, visiting a market, sampling local products, getting to know the townspeople. And let's put that dolce vita in our paintings before the memory fades away! 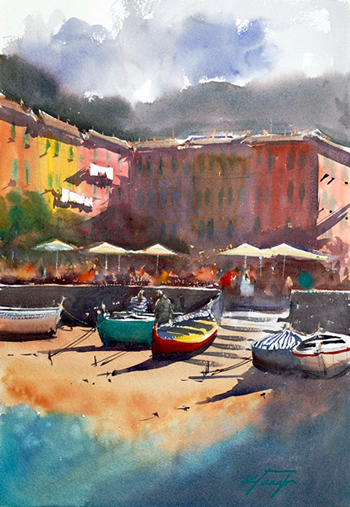 Watercolour on paper, 20" x 14"
One of the places we may visit during a painting week at the Watermill, Vernazza is an artist's dream come true for its charm and colors of an old Italian fishing village. Mostly self-taught, Keiko embarked on a professional art career in 2005. Since then, her paintings have been in many national and international exhibitions, both juried and invitational, and gained world-wide recognitions. She has done her solo exhibitions in California, Turkey, Italy and Russia. Her work has been purchased by private and corporate collectors from all around the world.She also had her paintings published and featured in leading art magazines and several publications in the U.S., Europe and Asia. A sought-after workshop instructor since 2011, she has conducted more than 180 workshops and numerous live demonstrations around the world. She has frequently served as a juror in art exhibitions. In 2015 she was named an official Ambassador for Winsor & Newton. In 2018, she was appointed to the advisory board of the American Watercolor Weekly. 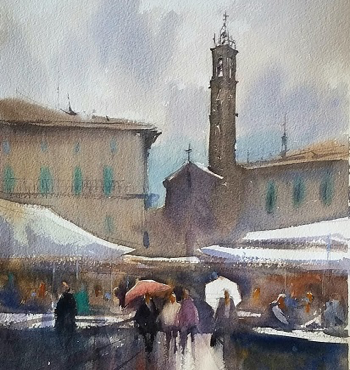 She is currently a member of National Watercolor Society (signature), American Watercolor Society, North American Watercolor Artists and American Impressionist Society. Keiko was born in Kyoto, Japan and currently lives in San Diego, California. You can find out more about her at www.ktanabefineart.com. "Watercolor painting is a language I have learned to speak to tell my stories of who we are and how we live. It is a creative tool to capture the simple truth in our everyday life that may be overlooked but tugs at my heartstrings. It is also a vehicle to communicate my artistic vision on the joy of living and the ingenuity of human creations. I travel near and far and paint with enthusiasm to celebrate the beauty we all share at this time on this planet." "When I am true to my inspiration, my brushstrokes sometimes surprise me by exposing something of my inner spirit I was not even aware of." "I used to lay down several layers in order to increase the intensity of values. But in doing that, I could lose freshness. Now I mix my darks first thing, and put in the accurate tonal value of the darks right away. My goal is to finish with fewer brushstrokes." 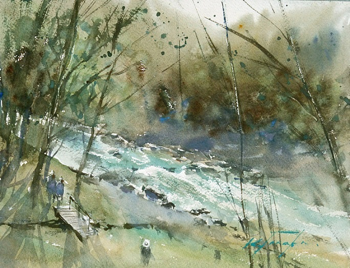 Keiko's workshop at the watermill is designed for students who would like to gain a better understanding of methods and techniques to make a watercolour painting that is full of light and atmosphere. Keiko will start with the fundamentals and discuss: the importance of a good design (perspective), understanding of tonal values, a variety of techniques in paint application and brush handling, how to simplify a complex scene, etc. You will paint different subject(s) every day, en plein-air weather permitting, and try different approaches to discover what is effective to create the kind of atmosphere you desire. Keiko will do two demonstrations a day. There'll be one-on-one guidance and a question-and-answer session on a daily basis. A class critique will be conducted at the end of workshop. A course will include: emphasis on perspective, design, values, atmosphere, colour choices Subjects will be: Landscape, Waterscape, Cityscape, Interior (café, restaurant,) Plein-air, weather permitting. If the weather is bad you will work indoors. The workshop is suitable for all levels, but a basic knowledge is strongly recommended. I had a truly wonderful week at the watermill. It was perfect in every sense. The food was worth coming for alone. Thank you both so much for being lovely people and Bill, you are a charming and witty host. I am also thoroughly enjoying your book.